NAMM 2019: It turns out that those rumours were true: Erica Synths is releasing a Eurorack version of Gamechanger Audio’s Plasma Pedal in the form of the Plasma Drive. A new kind of distortion unit, this works by boosting the signal to 3000V and transforming it into a xenon-filled tube. If that sounds a bit Doc Brown, it sort of is, with Erica saying that you’re effectively playing a lightning bolt, with the electrical discharges produced by your instrument being instantly converted back into an analogue audio signal to create characterful, heavy distortion. Great Scott. This being Eurorack, you get CV control over distortion and wet/dry mix, as well as octave up and 1 and 2 octave down tracking oscillators to add more harmonics to your signal. The Plasma Drive will be released on 20 February priced at €310. 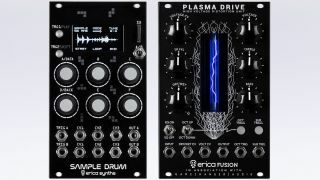 As well as this, Erica Synths has also confirmed that its long-awaited Sample Drum module is about to shoot out of the pipe. This sampler and sampler player comprises two identical parts that enable you to play back, record and slice samples in your modular system. There are various play modes, tuning functions, virtual VCAs, AD envelopes and realtime effects. The three CV inputs per channel are assignable, giving you plenty of opportunity for expression during performance, and 16-bit mono WAV samples can be loaded into RAM from SD card for instant playback response. A user-friendly interface is promised, further strengthening the Sample Drum’s live performance credentials. It costs €300 and will be released on 23 February. Find out more on the Erica Synths website.